This standard sets forth requirements for determining consequences as part of PRAs and related analysis methodologies that can be used to support risk-informed decisions for commercial nuclear power plants. 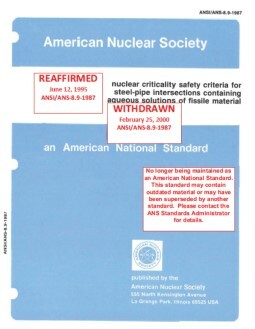 This standard also prescribes a process for applying these requirements for certain other applications involving release of radioactive materials into the atmosphere [e.g., non-light water reactor (LWR) nuclear power plants, research reactors, fuel cycle facilities, and non-reactor nuclear Department of Energy (DOE) facilities]. In these cases, supplemental requirements may be needed to ensure technical adequacy.